This morning's brief respite from the rain opened the door for me to give a go to the 2015 Coffeeneuring Challenge. I have started the challenge more than once in its 5 year history, but never successfully completed it. Maybe this year, but who knows. Doesn't matter, though - I like coffee, I like bikes, no time spent with the two is ever wasted, regardless of any parallel goals. I threw my dual fuel Coleman stove, my moka pot, a thermos full of grits, a banana, my bluetooth speaker and a book into a waterproof bag and headed out. After a quick stop at a gas station for some unleaded for the stove, I rode about 5 miles south on the American Tobacco Trail to CM Herndon Park for a "coffee shop without walls" trip. The forecast gave me about two hours of 0% chance of precipitation, but that turned out to be 0% accurate. I didn't get drenched, but I was less than comfortable. The concession area at the park gave me the break I was looking for from the wind and rain and I sparked up the stove and settled in for my warming cuppa. Coffeeneuring 2015, so far so good. 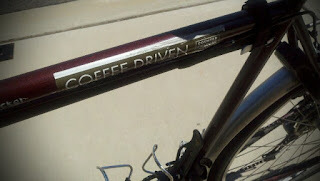 Coffee: Ethiopian from Sweet Maria's, roasted yesterday. My friend Brian asked me recently, "how do you define being 'buzzed' by a discourteous driver?" In answering his question, I want to add a few "best practice" type tips for all my motoring pals. Personally, I would feel "buzzed" by a motorist if they passed within 3 feet at speed. So, a full speed pass outside 3' may not feel like a buzz, and a slow pass at 3' may not feel like a buzz. If you feel like you have to "squeeze by," don't. It won't be comfortable for you or the cyclist. 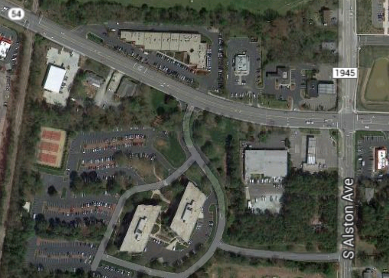 Legally, in NC, vehicles must maintain 2' separation. 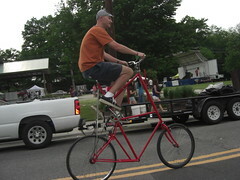 This is not bike specific, it pertains to all vehicles. 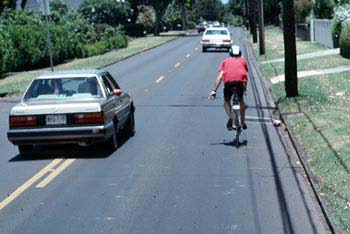 Typically, a 3-4' pass is the minimum distance that is comfortable for both motorists and cyclists. In fact, many bike advocates lobby for 3' passing laws in their states, and several states have adopted such regulations. But, honestly, the "best practice" in this regard is to give all the room you've got beyond 3-4'. If the whole oncoming lane, or a center turn lane is available, pull completely into it. If there is a solid center line, but no oncoming traffic, cross the line to make the safest pass. In addition to creating the safest and most comfortable pass for you and the cyclist, your wide pass will encourage motorists behind you to do the same. In many places, it may be technically illegal to cross a solid center line, but the smart advice I learned from the i am traffic folks holds here, too - don't let paint think for you! Big thanks to Brian for asking! It's incredibly cool for a motorist and casual cyclist to ask, not just about how much space one *has* to give, but also how much space is best for cyclists' comfort.